While exploring the Pescheria, I came upon this interesting placque. It's an official posting of the minimum size required for the sale of specific types of fish. Leave it to the Venetians to produce such a timeless looking thing like this. 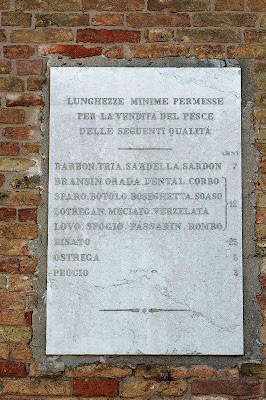 There's a similar sign in Fondamenta della Tana, in Castello behind the Arsenale. There must have been a local fish market there ealier. Another one in Campo Santa Margherita and many other places in Venice.